There is no need to put away the camera and head inside after the sun goes down and darkness falls. If the sky is clear and the conditions are right, you may still be able to make some great images. This article will take a look at making star trail photos, from the gear you need and basic camera settings, to techniques used to post-process the images. So let's jump right to it. Ideally, you want to have clear skies anytime you go out to photograph the stars. However, I don't totally shy away from shooting star trails if there are just a few light clouds passing through. In some instances, clouds could add a little bit of interest to an image, in my opinion. There are tons of apps to use on your smartphone to get a quick glance of the current weather conditions and the immediate forecast for your area. MyRadar is a free app for both iOS and Android devices, which provides weather forecasts and current radar so you know what weather is coming your way. Storm is another free application, for iOS only, which I haven't used, but has received lots of good reviews. One other very useful application for getting a good idea of cloud cover for your area is Weather Street. This is a desktop application for Windows and Mac users to see cloud cover in a percentage for every three hours. I have just learned of this website from my good friend Mike Ince, so I know it has to be good. There are a few basic things you are going to need before you venture out into the night. This is not an exhaustive list, but rather some of the things to get you started (as the title of this article implies). Some of these are no-brainers (who'da thunk that a camera would be on the list). There are a few things that you might not have thought of, and though they might not be absolutely necessary, they will make your shooting experience better, which could result in better images. A DSLR or mirrorless camera is obviously a good place to start. The nice thing is, you don't need one of the top of the line models. A basic, entry level camera will work just fine. Granted, the better your camera is at handling noise at higher ISOs, the cleaner the images will be, but don't let noise stop you from giving this a try. The important thing is that you have a good understanding of how to use it, particularly in manual mode, since that is how you'll be shooting. Some cameras have a built in intervalometer, which will make shooting a sequence of many images a breeze. However, if your camera does not have this feature, not to worry. We'll tackle that issue in just a minute. Generally speaking, you will want to use “fast” lenses for night photography. In other words, lenses that have very wide maximum apertures, such as f/2.8, f/1.8, or even f/1.4. The wider the aperture, the more light that the lens will let in to the camera's sensor. On the other hand, if all you have is the kit lens that came with your camera, that will probably work, too. Many entry-level camera kits come with an 18-55 mm lens, which has a maximum aperture of f/3.5 at its widest focal length (18 mm). Although you may have to bump up the ISO to increase the sensitivity of the sensor to light, that will work just fine for making star trail images. 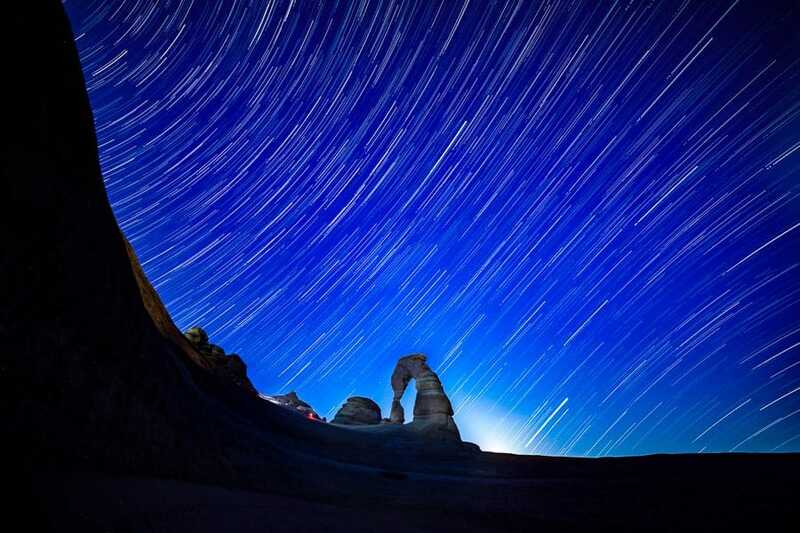 A lens with a wider focal length will typically be preferable when photographing the night sky. That sky is big, and you will want to show as much of it as possible. Shooting wide will help you to do that. Somewhere in the range of 14 to 24 mm will work nicely, but that doesn't mean you can't try that 35 mm lens or your “nifty fifty”. Keep in mind that with crop sensor cameras, you will need to multiply by 1.5x or 1.6x (depending on what camera you have) to get the effective field of view for a given focal length. In other words, when shooting at 18 mm on that same kit lens, the field of view will be closer to 27 mm. A good, sturdy tripod and ball head are going to be imperative for any type of night photography. When photographing the stars, you are going to have shutter speeds measuring in the seconds, so hand-holding won't be an option. If you don't have a tripod, or if the one you have is about as sturdy as a pile of pick up sticks, then you are going to need to invest in one at some point. There seem to be about as many tripod brands as there are stars in the sky, and quality, reliability, and price are highly variable. You've probably heard the phrase “buy cheap, buy twice”. That is very true when it comes to tripods, so don't skimp to save a few bucks. Do your research and purchase the best one you can get. It will be an investment that you won't regret. It would be great if all cameras had a built-in intervalometer, but camera manufacturers seem to enjoy torturing us photographers by leaving basic features out of some models, and putting them in others. My first DSLR (the Nikon D7000) had a built-in intervalometer. When I stepped up to the full frame Canon 5D Mark III, guess what? No intervalometer. Really!? If you don't have this feature on your camera, then you are going to need a cable release. A cable release may or may not have an intervalometer function, but either way, you can still set it up to automatically shoot a series of images without touching the camera. It also allows you to lock open the shutter in bulb mode for very long exposures (i.e. longer than 30 seconds). The Triggertrap is another device that works as a cable release by connecting your camera to your smartphone and using a mobile app. The downside of a cable release is that it is just another piece of gear, that takes batteries, and that could be forgotten at home or in the car. But at least they are relatively inexpensive compared to most other things photography related. News flash. If you are out taking pictures of stars, it's going to be dark (ideally). You will need some kind of light to help you see where you are going, to set up your camera, and to see the buttons and dials on your camera that need to be adjusted during the shoot. Some sort of light could also be used to aid in focusing your camera by either shining it on something or laying the light on the ground some distance away from the camera and focusing on it. My preference for a light to use on night shoots is a headlamp. This gives you light when and where you need it, but also keeps your hands free to do other things. You may have heard that using a red lens on your light will help to preserve night vision. There is some controversy as to whether or not this is true. Regardless of which color you use, it's a good idea to use it only as much as necessary and turn it off to let your eyes adjust to the darkness and to prevent contaminating the scene with unwanted light. Camera settings will vary dramatically, depending on whether you are shooting a single image with an extremely long exposure, or a series of many images that will be stacked together. For the purpose of this article, we will look at a basic starting point for camera settings for capturing a series of images. As has already been mentioned, you are likely going to want to shoot with a wide-angle lens, somewhere in the range of 14 to 24 mm. The wider angle will not only allow the camera to see a wider swath of the sky, but also be able to show more of the landscape below. Once you have set the desired focal length, you will need to do is set your focus to infinity. Some lenses actually have a marking for infinity focus (that sideways “8”), but setting it to that mark may not get the focus where it needs to be. Instead, point the camera at a distant light and try the autofocus. If the camera can lock focus on that light, then you will likely be at infinity focus and can turn off autofocus. If autofocus does not work, then turn on Live View and zoom way in on a distant light or even a bright star on the camera's LCD. Then use the manual focusing ring on the lens to get the light or star as sharp as possible. After you have the focus set, use a piece of gaffers tape on the lens to prevent accidentally moving the focus ring while shooting. Now that focus is set and the camera is locked down on a tripod, let's get down to business. As a general rule, your aperture will be set as wide as possible for the lens you are using. That leaves shutter speed and ISO to achieve the desired exposure, but before making those final adjustments, let's frame up the shot and make sure you are getting a desirable composition. Since it is dark, it will be hard to see to compose the shot. To make the process easier, I set my ISO very high (as much as 8,000 or even 10,000). These shots will be noisy and maybe overexposed, but all I'm looking at is the composition. I will also use a shorter shutter speed so I can speed up the process of capturing an image, adjusting the camera position, and re-shooting until I get the composition that I want. With the composition set, I will tone down the ISO to around 1,000 to 1,250 and set a shutter speed of 30 seconds. 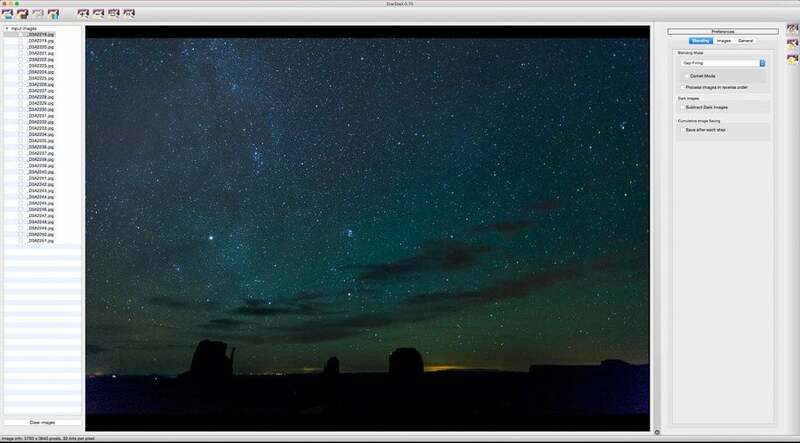 Take a shot of two to see how the stars and landscape look and also zoom in on the LCD to make sure the image looks sharp. Don't forget to look at the histogram since it will be difficult to judge exposure just by looking at the image on the LCD screen in the darkness. After you get your composition set and the correct exposure dialed in, it is time to get started on shooting the image sequence. If you are using an intervalometer (either in-camera or the cable release variety), you will need to program the interval at which the shutter will open to capture an image. The interval that is set will be the shutter speed plus a little extra time to let the image write to the card and let the camera prepare for the next shot. For every 15 seconds of shutter speed, you will need about 1 second of additional time added to the interval. So, with a shutter speed of 30 seconds, set the intervalometer to a minimum of 32 seconds. Just to be safe, I typically program in a little more cushion, and go with 33 or 34 seconds for a 30 second shutter speed. Once the shooting interval is set, you might choose to specify how many shots you want it to take. I'll usually go with at least 60 images, but will frequently let it go much longer than that. More images doesn't mean you have to use them all and you could use the longer image sequence to create a time-lapse video. Just remember that the more images you use, the longer the star trails will be in your final image. Finally, I almost always shoot in RAW image format so I have more data to work with in post-processing. Although white balance can easily be changed later (especially if you are shooting in RAW), I prefer cooler setting, somewhere in the 3,000 to 3,500 Kelvin range. Setting the white balance in camera will keep it more consistent across all your images. There are basically two different methods for shooting star trails: the image stacking method, which we have already discussed, or a single exposure. Shooting a single exposure of say 30 to 60 minutes may seem like a much simpler way to make a star trail image, but there are drawbacks to doing it this way. For starters, the longer the shutter is open, the more the sensor will heat up. A hotter sensor may mean more noise in your image. The weather could also have an impact, as the sensor would be more likely to heat up in the heat of the summer than on a cold winter night. For me, the biggest disadvantage to shooting one long exposure is the increased chance of not getting the shot. If at any time during the long exposure, the camera gets bumped or a wind gust causes slight camera movement, or if stray light contaminates the scene, then the entire shot may be ruined and you have to start all over. This would invariably happen to me 58 minutes into a 60 minute exposure. On the other hand, if one or two 30-second images in a sequence are unusable, you can throw those out and still have plenty to work with. The choice is yours, so maybe try both methods and see which one works best for you. Locate the North Star by using the “Pointer” stars in the Big Dipper. The direction you point the camera will have a big impact on how the resulting image looks. If you aim the camera toward the north star (or Polaris), the star trails will have the familiar circular pattern. This is caused by the rotation of the earth on its axis and the apparent fixed position of Polaris relative to the other stars that you see. In order to find Polaris, you need to have a general idea of where to look in the night sky. Fortunately, you can use what is perhaps the most recognized shape in the night sky – the Big Dipper – which is part of the constellation Ursa Major, to help you locate Polaris. 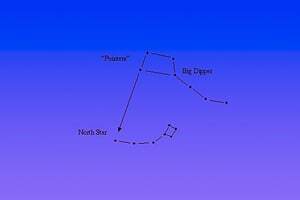 To find Polaris, draw an imaginary straight line through the last two stars of the Dipper, called the “Pointers”. This line will point to the north star, which will be roughly the same brightness as the stars in the Dipper. It should be noted that although the relative position of the north star will remain the same, the position of the constellations around it (the Big Dipper) will vary with season. 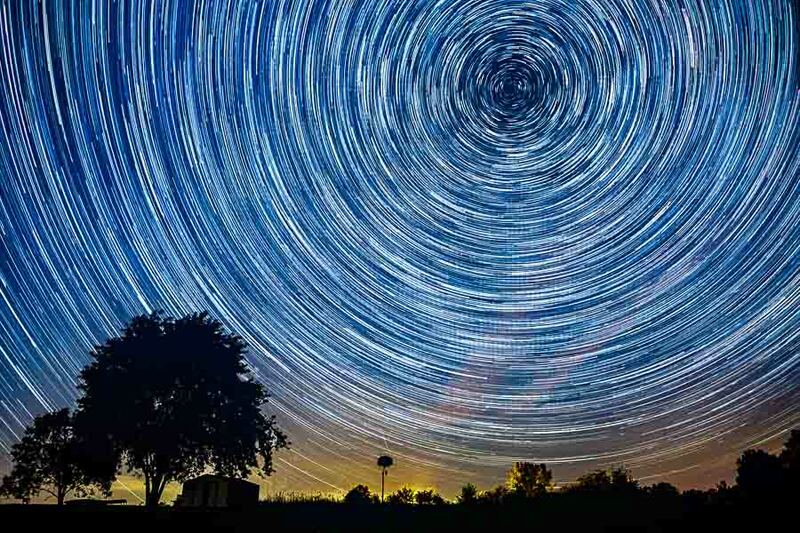 If you want to try for a different look for your star trails, shoot the images in a different direction. Shooting away from the north star will give star trails that are more elongated or create more of an arch over the landscape below. Experiment with it and see what you like best. You will usually hear that the best time to photograph the stars is during a New Moon, or when the moon is well below the horizon. This is certainly true when photographing the Milky Way, since you want the sky as dark as possible. It is somewhat true, although not quite as important, for star trails. A little bit of moon, in a crescent phase or smaller, won't totally ruin your shots. It may even help you out. For instance, if you are shooting in a very dark area, with tons of stars visible, star trail images could become too “busy” with all those stars. The moon will brighten the sky enough so that only the brighter stars show up in your images, which may give you a more pleasing result. The moon will also shed some light on the landscape and provide more foreground interest for a dynamic final result. In planning for a star trail shoot, check out the moon phase. If it's full, or nearly full, it just might not work since much fewer stars will be visible. 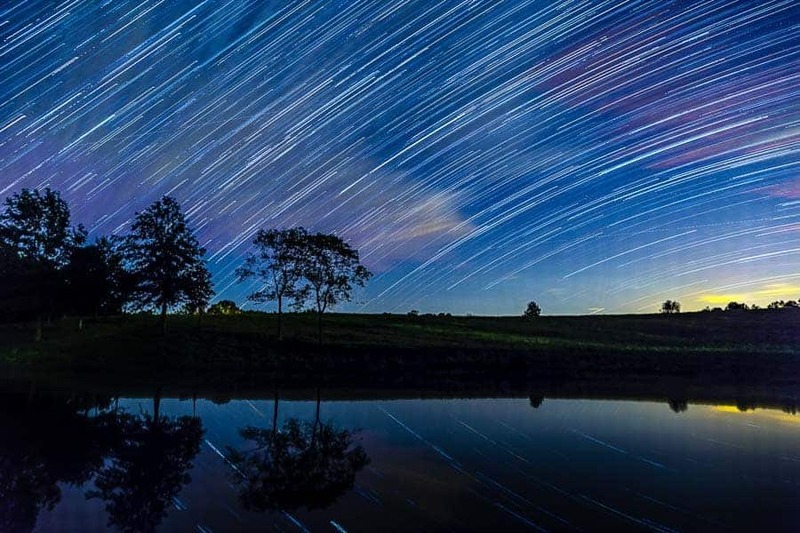 However, if the moon is at less than half, you may be able to create that star trail masterpiece. Stars in general look to same to everyone, everywhere. An image of just the stars, or star trails, isn't that interesting. Be sure to include some of the landscape to anchor the image and provide more visual interest. Something as simple as a tree could work. Or perhaps an old barn or abandoned house, or even an old car or tractor. Something to provide some scale and accentuate the vast expanse of space. Just remember that following the rule of thirds will be important. You will definitely want to show much more of the sky than the landscape. Since the stars are the star of the show, keep the landscape and foreground in at least the lower third of the image. Be sure when you go out shooting at night, that you dress accordingly for the weather conditions. The day may have been sunny and warm, but after the sun goes down, the temperature will drop and the night air can be a little cool. Bring along a light jacket, and maybe even some light gloves and a hat, if it's going to get really chilly. Pay attention to the weather forecast for the night that you plan to shoot, and bring along more than you think you will need. It's easy to take off a layer if you get too warm, but if you are cold and don't have anything to put on, you will not be comfortable and may have to cut the shooting short. 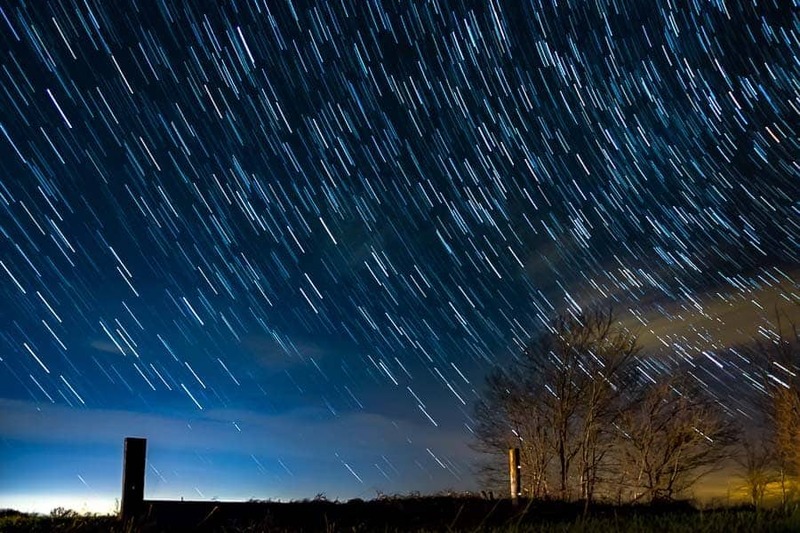 Since you may be out shooting for long periods of time to create star trails, it may also be a good idea to bring a small foldable chair or stool. Again, the focus should be on staying comfortable and making the shoot as enjoyable as possible. If you are shooting in the spring or summer months in more humid climates, there is a good chance that dew will collect on your camera and lens as the night air cools. This will create problems if your front lens element becomes covered with water droplets halfway through the shoot. One way to prevent the formation of dew on the lens is to wrap a chemically activated hand warmer around lens barrel to keep it warmer than the ambient air. These can be attached to the lens using rubber bands. Periodically check the lens to make sure it stays clear and you may want to have some microfiber cloths handy to wipe the lens clean if necessary. Make sure that your batteries are full and memory card is empty before heading out into the night. You will be shooting lots of images and don't want your battery to die or the memory card to fill up before the shooting is over. OK, so you've captured hundreds of images of the stars and are ready to put them all together to create a single star trail image. So, now what? There are several methods and different software applications that can be used to simplify this task. 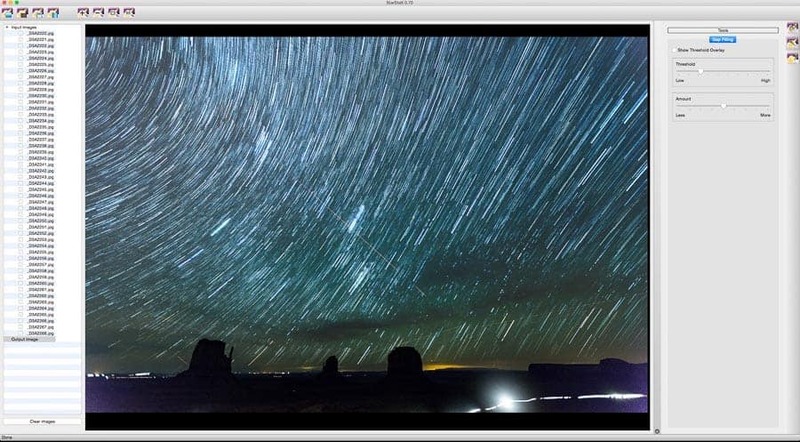 These include Adobe Photoshop, DeepSkyStacker, Startrails, and StarStaX, among others. Adobe's Photoshop, as well as Lightroom, are available with the Creative Cloud Photography subscription plan for $9.99 per month, which is a great deal. The other stacking software are available for free download as stand alone applications. The software that I'm most familiar with, and use for most all of my star trail images, is StarStaX. It is super easy to use and gives good results. If you are shooting RAW, you will first need to import the images into the image editor of your choice. Then, make adjustments to the first image in the sequence and apply those adjustments across all of the images to maintain consistency. After you have done this, then export the images as either JPEGs or TIFFs into a separate folder on your desktop. From there, open StarStaX and either drag the images into the application or browse to the folder and open them. Once the images are in StarStaX, you are ready to start the blending process. Start by opening the Preferences tab on the right side of the interface and select the Blending Mode. My preference is Gap Filling, since it will automatically try to fill in any gaps in the star trails. Then, with all of the images selected, click on the Start Processing button, which is the fourth button from left along the top of the screen. That's when the magic happens and you can watch on-screen as the images are stacked to make your star trails. 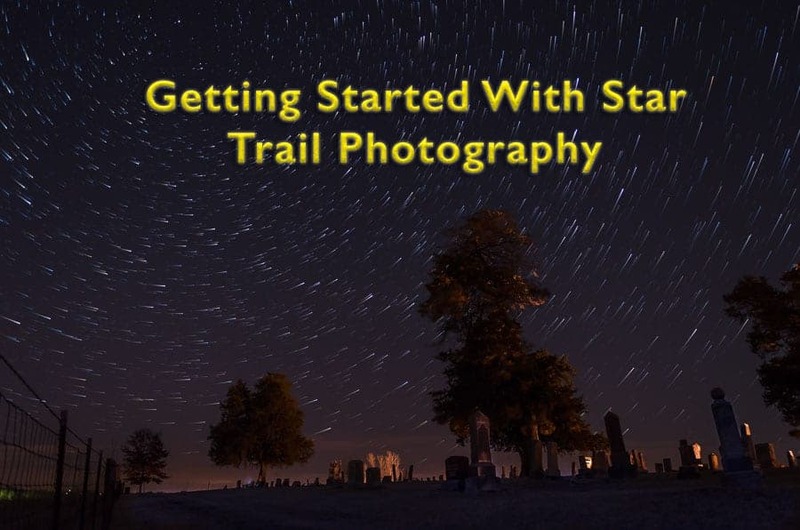 I hope this article has been helpful for you and will be useful for getting you started with making your own star trail images. It is loads of fun to do and can really challenge your creativity. So, get out there and enjoy the night!